Jennifer I Lim MD, Koushik Tripathy, MD (AIIMS), FRCS (Glasgow), Peter A.Karth, MD and Vinay A. Shah M.D. Assigned status Update Pending by Peter A.Karth, MD on May 23, 2018. Aflibercept is a soluble decoy receptor that binds vascular endothelial growth factor-A (VEGF-A), VEGF-B and placental growth factor (PIGF) with a greater affinity than the body’s native receptors. It is called a decoy receptor as VEGF does not bind to its original receptors and mistakenly binds with aflibercept, thereby reducing VEGF's activity. VEGF is a member of the platelet-derived growth factor (PDGF) family. The VEGF gene family consists of VEGF-A, VEGF-B, VEGF-C, VEGF-D and placental growth factor (PlGF), located on chromosome 6p12. The binding of VEGF with its receptors leads to endothelial cell proliferation and new blood vessel growth and therefore plays a key role in angiogenesis. New blood vessel growth and development are extremely complex and coordinated processes that require a cascade of receptor activations. In this cascade, VEGF represents an initial and critical rate-limiting step in physiological angiogenesis. The critical role of VEGF in angiogenesis can be seen in the fact that a loss of a single VEGF allele can result in defective vascularization. There are nine VEGF-A isoforms: VEGF121, VEGF145, VEGF148, VEGF162, VEGF165, VEGF165b, VEGF183, VEGF189 and VEGF206. The most abundant isoform found in the eye is VEGF165. VEGF165 is a secreted heparin-binding homodimeric 45-kDa glycoprotein with a significant fraction bound to the cell surface. VEGF activates endothelial cells by binding VEGFR-1 (Flt-1) and VEGFR-2 (KDR) endothelial cell receptors, which in turn activate intracellular signal transduction cascades. VEGFR-2 is thought to be principally responsible for VEGF signaling in angiogenesis. VEGF-A levels have been found to be elevated in the vitreous of patients with neovascular (wet) age-related macular degeneration (AMD),diabetic macular edema, and retinal vein occlusion. Choroidal neovascularization (CNV) in AMD may be instigated by several events, such as accumulation of lipid metabolic byproducts, oxidative stress, reduction in choriocapillaris blood flow, and alterations in Bruch’s membrane. Hypoxia has been shown to induce VEGF gene transcription. As a response to metabolic distress, the retinal pigment epithelium (RPE) and retinal tissue produce various factors, particularly VEGF, which induce CNV proliferation. VEGF has been shown to be a chemo-attractant for endothelial cell precursors, causing CNV in mouse models. VEGF also prevents endothelial cell apoptosis. Additionally, VEGF promotes metalloproteinase production by endothelial cells, causing tissue degradation that facilitates invasion by new vessels. VEGF is a powerful agonist of vascular permeability, which causes vascular leakage and macular edema. Placental Growth Factor (PIGF) may work synergistically with VEGF, contributing to vascular inflammation and leukocyte infiltration. VEGF is thought to cause increased vascular permeability by formation of fenestrations in microvascular endothelium. Furthermore, VEGF was shown to up-regulate leukocyte adhesion to ICAM-1 in mice, thereby promoting vascular permeability and capillary non-perfusion. On this basis, inhibition of VEGF activity is central to the treatment of macular edema and prevention of progressive capillary non-perfusion, especially in diabetic retinopathy and retinal vein occlusion. Aflibercept is a 115 kDa fusion protein. It consists of an IgG backbone fused to extracellular VEGF receptor sequences of the human VEGFR1 and VEGFR2. As a soluble decoy receptor, it binds VEGF-A with a greater affinity than its natural receptors. In an experimental model, aflibercept’s equiibrium disassociation constant (Kd, inversely related to binding affinity) for VEGF-A165 was 0.49 pM, compared with 9.33 pM and 88.8 pM for experimental native VEGFR1 and VEGFR2, respectively. Aflibercept’s high affinity for VEGF prevents the subsequent binding and activation of native VEGF receptors. Reduced VEGF activity leads to decreased angiogenesis and vascular permeability. Inhibition of PIGF and VEGF-B may also aid the treatment of angiogenic conditions. PIGF has been associated with angiogenesis and can be elevated in multiple conditions, such as wet AMD. VEGF-B overexpression has recently been connected with breakdown of the blood-retinal battier retinal angiogenesis.Thus, inhibition of VEGF-A, VEGF-B, and PIGF may all contribute to the efficacy of aflibercept. Intravitreal aflibercept injection (EYLEA®; Regeneron Pharmaceuticals, Inc) was approved by the FDA in 2011 for the treatment of neovascular (wet) age-related macular degeneration (AMD) following two large clinical trials. Since then, it has also been approved for macular edema following retinal vein occlusion (RVO), diabetic macular edema (DME), and, most recently for diabetic retinopathy (DR) in patients with DME. Ziv-aflibercept (Zaltrap®, Sanofi, developed in collaboration with Regeneron Pharmaceuticals, Inc.) in combination with 5-flourouracil, leucovorin, irinotecan-(FOLFIRI), is indicated for patients with metastatic colorectal cancer (mCRC) that is resistant to or has progressed following an oxaliplatin‑containing regimen. Ziv-aflibercept contains the same protein (active drug) as aflibercept, but is specifically formulated for injection as an intravenous infusion. 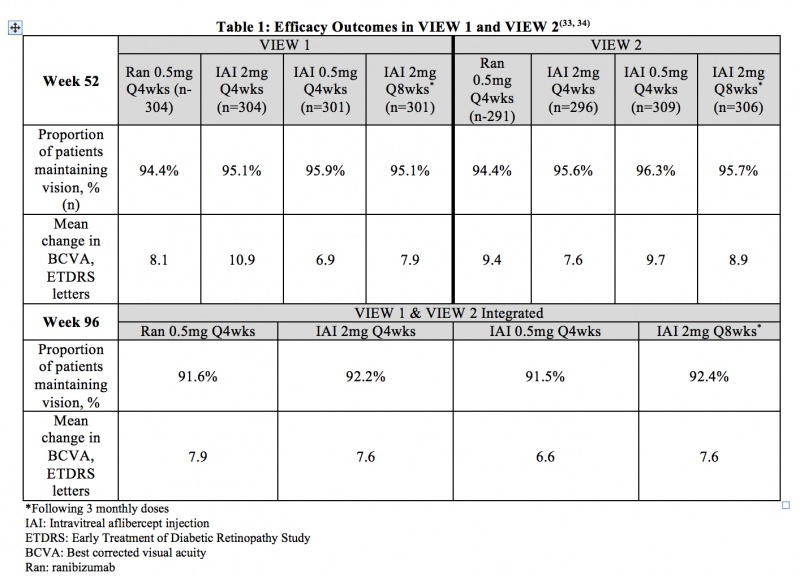 Ziv-aflibercept is not intended for ophthalmic use, as the osmolarity of the ziv-aflibercept preparation is significantly higher than that of intravitreal aflibercept injection. However, intravitreal ziv-aflibercept has been used with success for multiple ocular conditions with acceptable safety profile. Neovascular (Wet) Age-Related Macular Degeneration (AMD) - The recommended dose for aflibercept is 2 mg (0.05 mL or 50 microliters) administered by intravitreal injection every 4 weeks (monthly) for the first 12 weeks (3 months), followed by 2 mg (0.05 mL) via intravitreal injection once every 8 weeks (2 months). and Diabetic Retinopathy (DR) in Patients with DME- The recommended dose for aflibercept is 2 mg (0.05 mL or 50 microliters) administered by intravitreal injection every 4 weeks (monthly) for the first 5 injections, followed by 2 mg (0.05 mL) via intravitreal injection once every 8 weeks (2 months). Aflibercept is typically given by transconjunctival intravitreal injections into the posterior segment via the pars plana. Aflibercept is supplied as one single-use, 3-mL, sterile, glass vial. It is designed to deliver .05 mL of 40 mg/mL. It should be refrigerated at 2-8 degrees C. It should not be frozen or used beyond the date on the carton and container label. Diabetic Retinopathy (DR) in Patients with DME – In the VIVID and VISTA trials, patients’ Diabetic Retinopathy Severity Score (DRSS) were assessed at baseline and approximately every 6 months thereafter for the duration of the study. The proportion of patients who experienced a > 2 step improvement in DRSS at 100 weeks was included as a secondary endpoint of the studies. In VIVID, 29.3% of patients improved at least 2 steps on ETDRS-DRSS from baseline with IAI 2mg q4 weeks administration and 32.6% with IAI 2 mg q8 weeks administration, compared to 8.2% in the laser control group. In VISTA, 37.1% of patients improved at least 2 steps on ETDRS-DRSS from baseline with Q4 weeks administration and 37.1% with Q8 weeks administration, compared to 15.6% in the laser control group. Three major warnings and precautions have been noted: 1) Endophthalmitis and retinal detachments have been reported, on rare occasions, after intravitreal injection, including after intravitreal aflibercept injection 2) Acute intraocular pressure elevations have been reported within 60 minutes of intravitreal injection, including with intravitreal aflibercept injection 3) Arterial thromboembolic events have been reported, on rare occasions, after intravitreal administration of VEGF inhibitors, including with intravitreal aflibercept injection. The most commonly reported adverse reactions (>5%) include conjunctival hemorrhage, eye pain, cataract, vitreous floaters, intraocular pressure increased, and vitreous detachment. Bacterial endophthalmitis has been reported following the use of all intravitreal anti-VEGF medications. Large retrospective reviews show the rate of infection with intravitreal anti-VEGF medications to be between 0.022% and 0.16%. Intravitreal aflibercept, bevacizumab, and ranibizumab are all commonly used to treat a variety of retinal diseases. Some key areas of comparison are listed here. The incidence of serious systemic adverse effects is rare with all 3 medications.Specifically, the incidence of arteriothrombotic events and death have been found to be similar for all 3 medications. Diabetic Retinopathy Clinical Research (DRCR) Network Protocol T is a two-year, randomized, multi-center clinical trial at 89 United States sites evaluating the safety and efficacy of intravitreal aflibercept, bevacizumab and ranibizumab in central-involved DME patients with visual acuity (VA) of 20/32 to 20/320. This independent study was supported by the National Institutes of Health (NIH), and was the first randomized clinical trial comparing these three anti-VEGF medications in any indication. The study enrolled 660 patients. The primary endpoint was the mean change in visual acuity from baseline at one year. The results showed that all three medications were safe and effective. At year 1 for the primary endpoint, intravitreal aflibercept demonstrated a significantly greater improvement in visual acuity compared to both bevacizumab and ranibizumab, especially in patients presenting with worse visual acuity. In this study, sub-groups based on visual acuity were prospectively delineated to be 20/40 or better and 20/50 or worse (pre-defined sub-groups). In the group presenting with 20/40 or better vision, no statistically significant difference was found between the three drugs. In the group presenting with 20/50 or worse vision, intravitreal aflibercept showed statistically significant superior visual acuity outcomes, with monthly injections. Fewer injections (one less injection over one year) and laser photocoagulation treatments were reported in the intravitreal aflibercept group. Ocular and systemic adverse events were reported to have similar frequencies for all 3 groups (no statistical significant differences in key safety metrics). A single dose of intravitreal aflibercept (~$1,850/dose) is comparable in cost to ranibizumab (~$1,950/dose for 0.5mg dose), although notably more expensive than compounded bevacizumab (~$50/dose). However, the FDA approved treatment schedule of intravitreal aflibercept in DME and AMD indicates fewer injections over time, as compared to FDA approved treatment schedules for ranibizumab. All three medications are considered safe and effective for treatment of neovascular (wet) age-related macular degeneration (AMD), macular edema following retinal vein occlusion (RVO), diabetic macular edema (DME), and, most recently, diabetic retinopathy (DR) in patients with DME. All three medications are widely used in the USA and throughout the globe. Original Author: Christian Swinney B.A. and Peter A Karth, M.D., M.B.A.
Turbert D, Vemulakonda GA. Anti-VEGF Treatments. American Academy of Ophthalmology. EyeSmart® Eye health. https://www.aao.org/eye-health/drugs/anti-vegf-treatments-list. Accessed March 07, 2019. Turbert D, Vemulakonda GA. Eylea. American Academy of Ophthalmology. EyeSmart® Eye health. https://www.aao.org/eye-health/drugs/eylea-list. Accessed March 07, 2019. ↑ Sharma, Yog Raj, Koushik Tripathy, Pradeep Venkatesh, and Varun Gogia. “Aflibercept – How Does It Compare with Other Anti-VEGF Drugs?” Austin J Clin Ophthalmol 1, no. 3 (2014): 1016. ↑ 2.0 2.1 2.2 2.3 2.4 2.5 2.6 2.7 2.8 2.9 Papadopoulos N, Martin J, Ruan Q, et al. Binding and neutralization of vascular endothelial growth factor (VEGF) and related ligands by VEGF Trap, ranibizumab and bevacizumab. Angiogenesis. 2012;15:171-185. ↑ 3.0 3.1 3.2 3.3 3.4 3.5 3.6 Stewart MW, Rosenfeld PJ. Predicted biological activity of intravitreal VEGF-Trap. Br J Ophthalmol. 2008;92:667-668. ↑ . Pasqualetti G, Danesi R, Del Tacca M, Bocci G. Vascular endothelial growth factor pharmacogenetics: a new perspective for anti-angiogenic therapy. Pharmacogenomics. 2007;8(1):49-66. ↑ Yancopoulos GD, Davis S, Gale NW, Rudge JS, Wiegand SJ, Holash J. Vascular-specific growth factors and blood vessel formation. Nature. 2000;407(6801):242-8. ↑ Carmeliet P. Angiogenesis in health and disease. Nat Med. 2003;9(6):653-60. ↑ Jain RK. Molecular regulation of vessel maturation. Nat Med. 2003;9(6):685-93. ↑ Ferrara N. Vascular endothelial growth factor: basic science and clinical progress. Endocr Rev. 2004;25(4):581-611. ↑ Bhisitkul RB. Vascular endothelial growth factor biology: clinical implications for ocular treatments. Br J Ophthalmol. 2006;90(12):1542-7. ↑ Soker S, Takashima S, Miao HQ, Neufeld G, Klagsbrun M. Neuropilin-1 is expressed by endothelial and tumor cells as an isoform-specific receptor for vascular endothelial growth factor. Cell. 1998;92(6):735-45. ↑ Keyt BA, Berleau LT, Nguyen HV, Chen H, Heinsohn H, Vandlen R et al. The carboxyl-terminal domain (111-165) of vascular endothelial growth factor is critical for its mitogenic potency. J Biol Chem. 1996;271(13):7788-95. ↑ 12.0 12.1 12.2 Ng EWM, Adamis AP. Targeting angiogenesis, the underlying disorder in neovascular age-related macular degeneration. Can J Ophthalmol. 2005;40(3):352-68. ↑ Frank RN. Growth factors in age-related macular degeneration: pathogenic and therapeutic implications. Ophthalmic Res. 1997;29(5):341-53. ↑ Gass JD. Pathogenesis of disciform detachment of the neuroepithelium. Am J Ophthalmol. 1967;63(3):Suppl:1-139. ↑ Green WR, Enger C. Age-related macular degeneration histopathologic studies. The 1992 Lorenz E. Zimmerman Lecture. Ophthalmology. 1993;100(10):1519-35. ↑ Green WR. Histopathology of age-related macular degeneration. Mol Vis. 1999;5:27. ↑ Asahara T, Takahashi T, Masuda H, Kalka C, Chen D, Iwaguro H et al. VEGF contributes to postnatal neovascularization by mobilizing bone marrow-derived endothelial progenitor cells. EMBO J. 1999;18(14):3964-72. ↑ Alon T, Hemo I, Itin A, Pe'er J, Stone J, Keshet E. Vascular endothelial growth factor acts as a survival factor for newly formed retinal vessels and has implications for retinopathy of prematurity. Nat Med. 1995;1(10):1024-8. ↑ Lamoreaux WJ, Fitzgerald ME, Reiner A, Hasty KA, Charles ST. Vascular endothelial growth factor increases release of gelatinase A and decreases release of tissue inhibitor of metalloproteinases by microvascular endothelial cells in vitro. Microvasc Res. 1998;55(1):29-42. ↑ Hiratsuka S, Nakamura K, Iwai S, Murakami M, Itoh T, Kijima H et al. MMP9 induction by vascular endothelial growth factor receptor-1 is involved in lung-specific metastasis. Cancer Cell. 2002;2(4):289-300. ↑ Senger DR, Galli SJ, Dvorak AM, Perruzzi CA, Harvey VS, Dvorak HF. Tumor cells secrete a vascular permeability factor that promotes accumulation of ascites fluid. Science. 1983;219(4587):983-5. ↑ Roberts WG, Palade GE. Increased microvascular permeability and endothelial fenestration induced by vascular endothelial growth factor. J Cell Sci. 1995;108 ( Pt 6):2369-79. ↑ Roberts WG, Palade GE. Neovasculature induced by vascular endothelial growth factor is fenestrated. Cancer Res. 1997;57(4):765-72. ↑ Miyamoto K, Khosrof S, Bursell SE, Moromizato Y, Aiello LP, Ogura Y et al. Vascular endothelial growth factor (VEGF)-induced retinal vascular permeability is mediated by intercellular adhesion molecule-1 (ICAM-1). Am J Pathol. 2000;156(5):1733-9. ↑ Cao Y. Positive and negative modulation of angiogenesis by VEGFR1 ligands. Sci Signal. 2009;2:rel. ↑ Carmeliet P, Moons L, Luttun A, Vincenti V, Compernolle V, Mol M, Wu Y, Bono F, Devy L, Beck H, Scholz D, Acker T, DiPalma T, Dewerchin M, Noel A, Stalmans I, Barra A, Blacher S, Vandendriessche T, Ponten A, Eriksson U, Plate KH, Foidart JM, Schaper W, Charnock-Jones DS, Hicklin DJ, Herbert JM, Collen D, Persico MG. Synergism between vascular endothelial growth factor and placental growth factor contributes to angiogenesis and plasma extravasation in pathological conditions. Nat Med. 2001;7:575–583. ↑ Witmer AN, Vrensen GF, Noorden CJ, Schlingemann RO. Vascular endothelial growth factors and angiogenesis in eye disease. Prog Retin Eye Res. 2003;22:1–29. ↑ Miyamoto N, Kozak Y, Jeanny JC, Glotin A, Mascarelli F, Massin P, BenEzra D, Behar-Cohen F. Placental growth factor-1 and epithelial haemato-retinal barrier breakdown: potential implication in the pathogenesis of diabetic retinopathy. Diabetologia. 2007;50:461–470. ↑ Zhong X, Huang H, Shen J, Zacchigna S, Zentilin L, Giacca M, Vinores SA. Vascular endothelial growth factor-B gene transfer exacerbates retinal and choroidal neovascularization and vasopermeability without promoting inflammation. Mol Vis. 2011;17:492–507. ↑ 30.0 30.1 30.2 30.3 30.4 EYLEA® aflibercept Injection full U.S. prescribing information. Regeneron Pharmaceuticals, Inc. July 2015. ↑ Semeraro F, Morescalchi F, Duse S, Parmeggiani F, Gambicorti E, Costagliola C. Aflibercept in wet AMD: specific role and optimal use. Drug Des Devel Ther. 2013;7:711-22. ↑ Cabrera López F. Management of aflibercept in routine clinical practice. Arch Soc Esp Oftalmol. 2015;90 Suppl 1:29-34. ↑ Zaltrap® (ziv-aflibercept) full U.S. prescribing information. Sanofi-aventis U.S., LLC. September 2014. ↑ Singh, Sumit Randhir, Michael W Stewart, Goura Chattannavar, Mohammed Ashraf, Ahmed Souka, Mazen ElDardeery, Neeraj Wadhwa, et al. “Safety of 5914 Intravitreal Ziv-Aflibercept Injections.” British Journal of Ophthalmology, August 11, 2018, bjophthalmol-2018-312453. https://doi.org/10.1136/bjophthalmol-2018-312453. ↑ 35.0 35.1 Heier JS et al. Intravitreal Aflibercept (VEGF Trap-Eye) in Wet Age-Related Macular Degeneration. Ophthalmology. 2012;119(12):2537-2548. ↑ 36.0 36.1 Schmidt-Erfurth, U. et al. Intravitreal Aflibercept (VEGF Trap-Eye) in Wet Age-Related Macular Degeneration: Ninety-six week results of the VIEW studies. Ophthalmology. 2014 121, 193–201. ↑ 37.0 37.1 Korobelnik JF, Do DV, Schmidt-Erfurth U, et al. Intravitreal Aflibercept for Diabetic Macular Edema. Ophthalmology. 2014 Nov;121(11):2247-2254. ↑ 38.0 38.1 38.2 Brown DM, Schmidt-Erfurth U, Do DV et al. 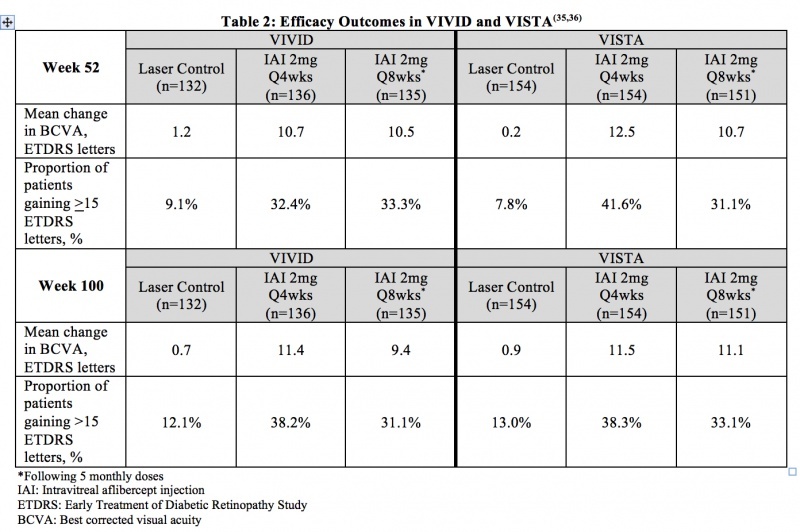 Intravitreal Aflibercept for Diabetic Macular Edema: 100 week results from the VISTA and VIVID studies. Ophthalmology. In press. http://dx.doi.org/10.1016/j.ophtha.2015.06.017. ↑ 39.0 39.1 Boyer D et al. Vascular endothelial growth factor Trap-Eye for macular edema secondary to central retinal vein occlusion: six-month results of the phase 3 COPERNICUS study. Ophthalmology. 2012;119(5):1024-1032. ↑ 40.0 40.1 Korobelnik JF et al. 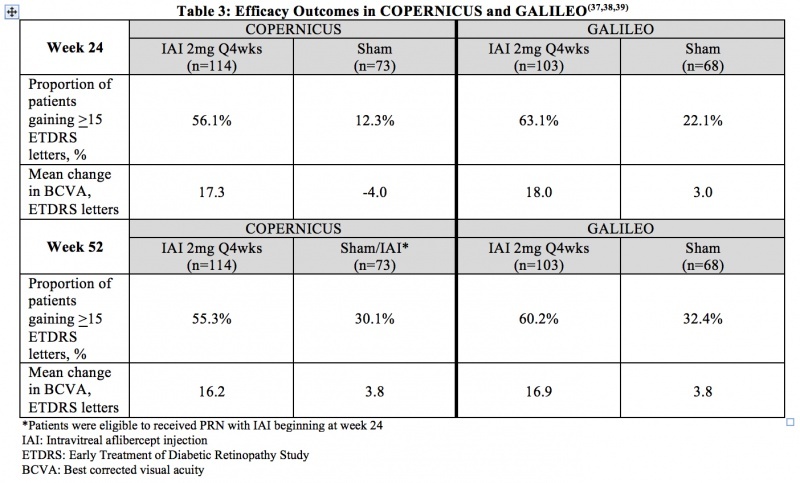 Intravitreal aflibercept injection for macular edema resulting from central retinal vein occlusion: one-year results of the phase 3 GALILEO study. Ophthalmology. 2014;121(1):202-208. ↑ 41.0 41.1 Brown, D.M. ; Heier, J.S. ; Clark, W.L. ; Boyer, D.S. ; Vitti, R.; Berliner, A.J. ; Zeitz, O.; Sandbrink, R.; Zhu, X.; Haller, J.A. Intravitreal aflibercept injection for macular edema secondary to central retinal vein occlusion: 1-year results from the phase 3 COPERNICUS study. Am. J. Ophthalmol. 2013, 155, 429–437. ↑ 42.0 42.1 Campochiaro PA, Clark WL, Boyer DS, Heier JS, Brown DM, Vitti R, Kazmi H, Berliner AJ, Erickson K, Chu KW, Soo Y, Cheng Y, Haller JA. Intravitreal aflibercept for macular edema following branch retinal vein occlusion: the 24-week results of the VIBRANT study. Ophthalmology. 2015 Mar;122(3):538-44. ↑ 43.0 43.1 Data on file. Regeneron Pharmaceuticals, Inc.
↑ Fintak DR, Shah GK, Blinder KJ, Regillo CD, Pollack J, Heier JS et al. Incidence of endophthalmitis related to intravitreal injection of bevacizumab and ranibizumab. Retina. 2008;28(10):1395-9. ↑ Thomas M, Mousa S, and Mousa S. Comparative effectiveness of aflibercept for the treatment of patients with neovascular age-related macular degeneration. Clin Ophthalmol. 2013; 7: 495–501. ↑ Stewart MW. Clinical and differential utility of VEGF inhibitors in wet age-related macular degeneration: focus on aflibercept. Clin Ophthalmol. 2012;6:1175–1186. ↑ Stewart MW, Grippon S, Kirkpatrick P. Aflibercept. Nat Rev Drug Discov. 2012;11(4):269–270. ↑ Johnson D, Sharma S. Ocular and systemic safety of bevacizumab and ranibizumab in patients with neovascular age-related macular degeneration. Curr Opin Ophthalmol. 2013;24(3):205-12. ↑ Scott LJ, Chakravarthy U, Reeves BC, Rogers CA. Systemic safety of anti-VEGF drugs: a commentary. Expert Opin Drug Saf. 2015;14(3):379-88. ↑ Lynch SS, Cheng CM. Bevacizumab for neovascular ocular diseases. Ann Pharmacother. 2007;41(4):614-25. ↑ Rosenfeld PJ, Moshfeghi AA, Puliafito CA. Optical coherence tomography findings after an intravitreal injection of bevacizumab (avastin) for neovascular age-related macular degeneration. Ophthalmic Surg Lasers Imaging. 2005;36(4):331-5. ↑ 52.0 52.1 52.2 Diabetic Retinopathy Clinical Research Network, Wells JA, Glassman AR, Ayala AR, Jampol LM, Aiello LP, Antoszyk AN, Arnold-Bush B, Baker CW, Bressler NM, Browning DJ, Elman MJ, Ferris FL, Friedman SM, Melia M, Pieramici DJ, Sun JK, Beck RW. Aflibercept, bevacizumab, or ranibizumab for diabetic macular edema. N Engl J Med. 2015;372(13):1193-203. ↑ StewartM, GripponS, Kirkpatrick P. Aflibercept. Nature Reviews Drug Discovery. 2012;11:269-270. ↑ Martin, D. F. et al. Ranibizumab and bevacizumab for neovascular age-related macular degeneration. N. Engl. J. Med. 2011;364:1897–1908. ↑ Kumar, Atul, Koushik Tripathy, and Rohan Chawla. “Intraocular Use of Bevacizumab in India: An Issue Resolved?” The National Medical Journal of India 30, no. 6 (December 2017): 345–47. https://doi.org/10.4103/0970-258X.239079. This page was last modified on March 7, 2019, at 16:25. This page has been accessed 33,609 times.